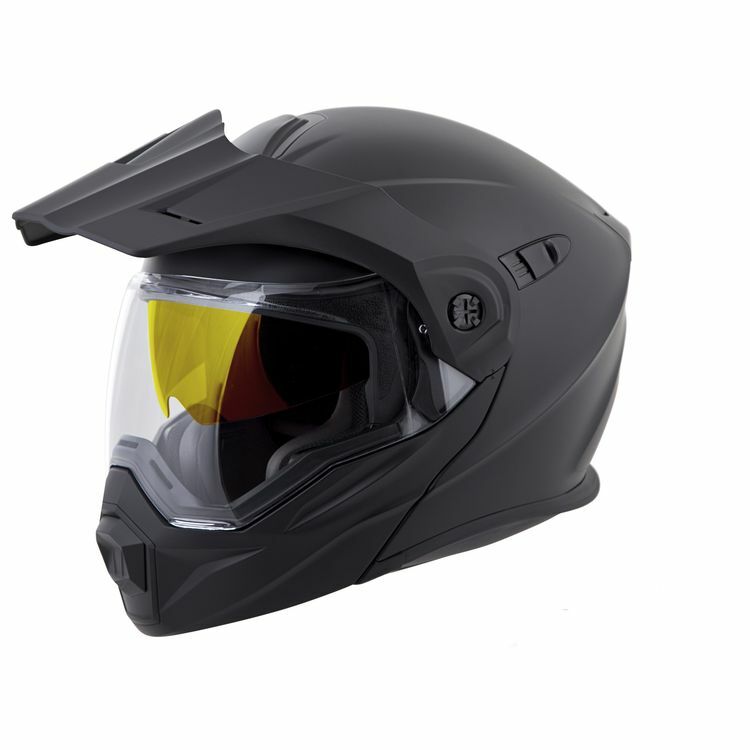 Scorpion has once again redefined a segment, melding the best features of a dual sport helmet with a dual pane lens for winter riding. The Scorpion EXO-AT950 Snow Helmet is the all-in-one swiss army knife of the helmet world. The modular chin bar allows you to relieve your claustrophobia or ask for directions while the off-road style peak and large eye port deflects roost, blocks the sun and allows you to wear goggles when tearing up the trails. Additional features such as a Everclear anti-fog dual pane face shield and Speedview drop-down internal sun visor keeps your vision clear and ready for whatever is around the next corner. If you're going to be hitting the snow, the peak visor is easily removed to give you an aerodynamic profile so you can bug out at speed. Eyeglass compatible cheek pads and a KwikWick II liner ensures total comfort. The only helmet I need. This is an amazing helmet. I rock it on my KLX250 - I rock it on my Z900. The cashier at the local grocery store called me 'Master Chief' when I walked in with it on. The fit is too round and had pressure points on the side of my forehead. I used a razor to knock down the points in the EPS. Now it's great. The helmet is louder than my Shoei. I bought the cold weather box for it and the tinted visor. I love it. Great price. Scorpion just needs to get their fit rite on it.